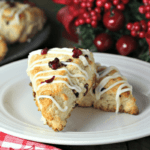 Lightly sweetened with dried cranberries and glazed with white chocolate, White Chocolate Cranberry Scones are a festive—and tasty—holiday treat. 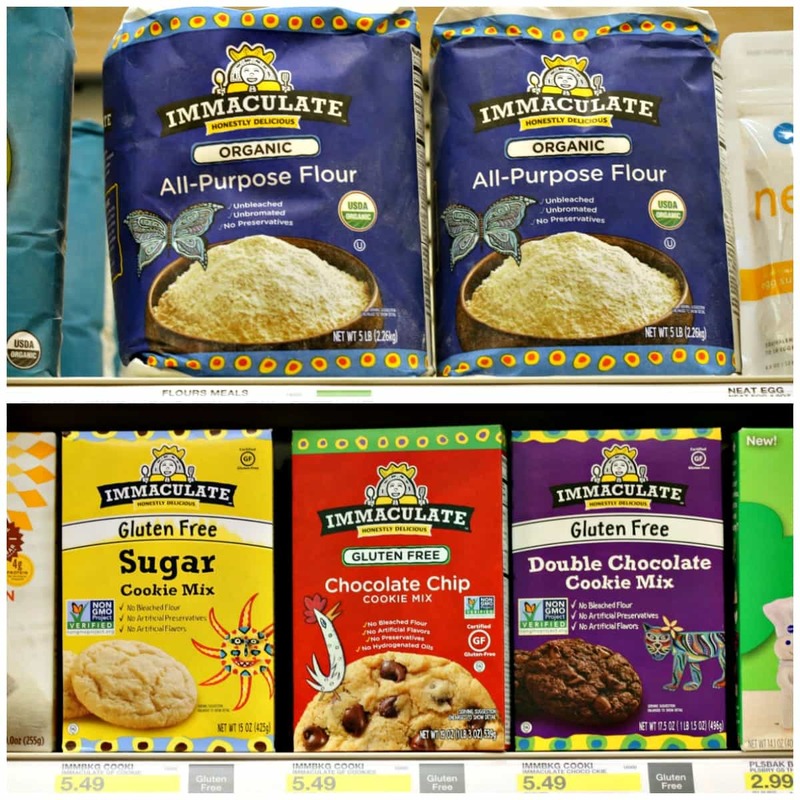 Holiday baking season is here! I love this season of cookie swaps, gift-giving, and sharing goodwill and cheer! Don’t you agree that the best gifts are those given (or baked) with love? Who doesn’t enjoy receiving a tin of homemade cookies, or better yet, a basket of fresh White Chocolate Cranberry Scones?! 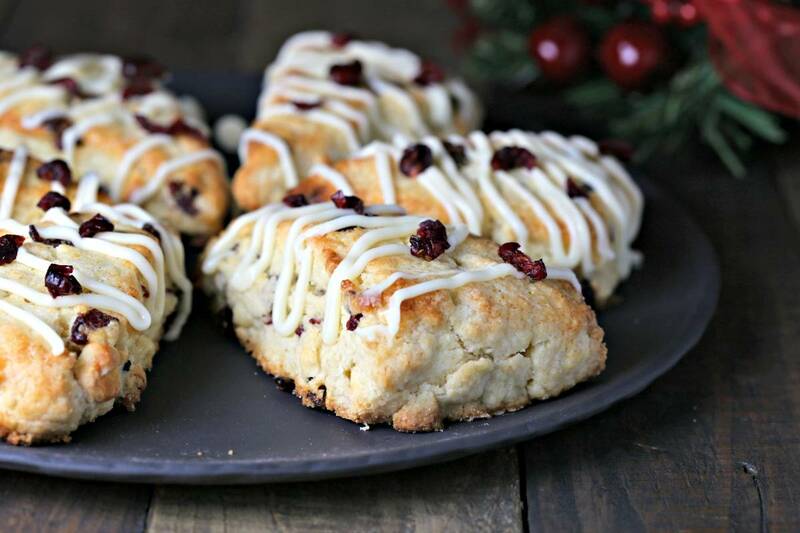 Scones are perfect for Christmas brunch or with an afternoon coffee or tea…a yummy gift, indeed! One of my scone-baking secrets is that I pop my butter into the freezer for a few minutes before mixing up the scones. 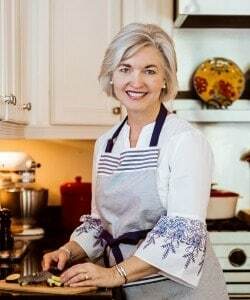 Once the butter is really cold and firm, I use a four-sided box grater to grate the butter and then stir it into my dry ingredients (no need for a pastry blender). Next, I add cream and any other ingredients and stir until dry ingredients are just moistened. 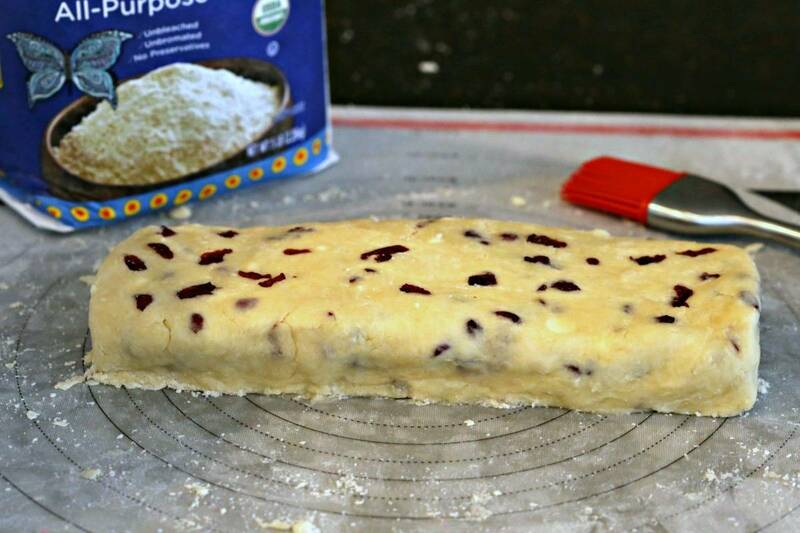 Dump the shaggy dough onto a pastry board, press together, and pat into a log shape. I also use a pastry cutter to cut the log into four equal pieces, and then cut each piece into two triangles. Before making, brush each scone with more cream and sprinkle with sugar to get a nice texture on top. See how easy that is?! Now, let’s get baking! 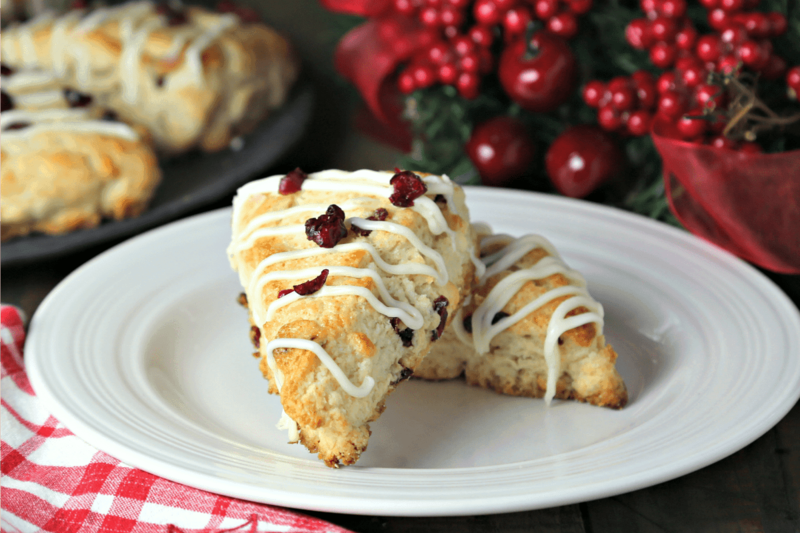 Keep scrolling for my White Chocolate Cranberry Scone recipe…Enjoy, friends! 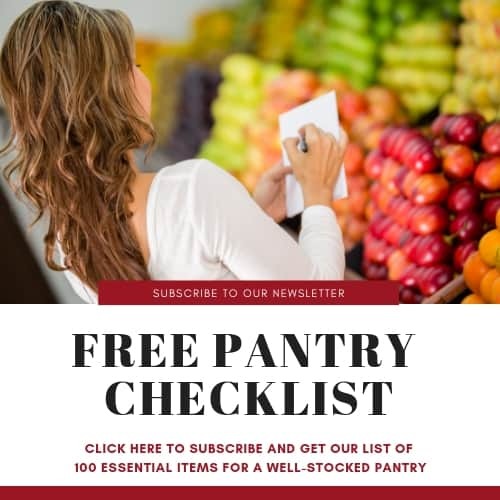 In a large bowl, whisk together the flour, sugar, baking powder and salt. Freeze butter for at least 15-20 minutes, then grate using a four-sided box grater. 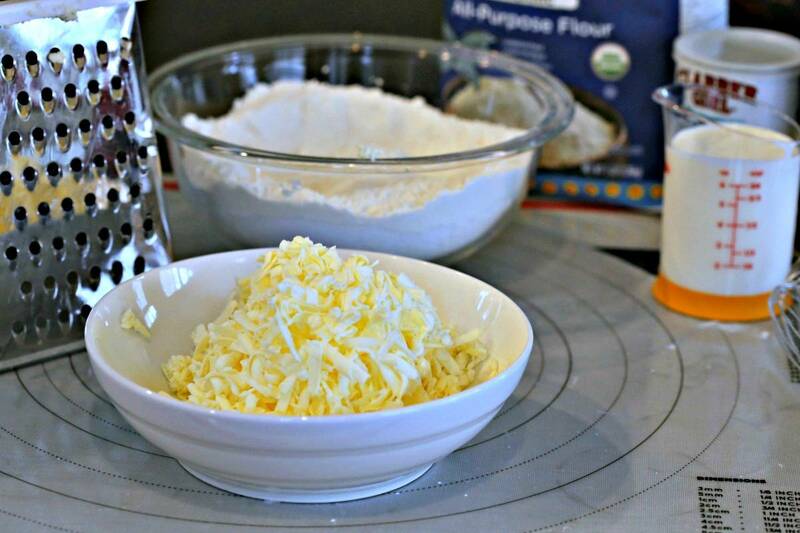 Add butter to flour mixture and stir together with a fork. 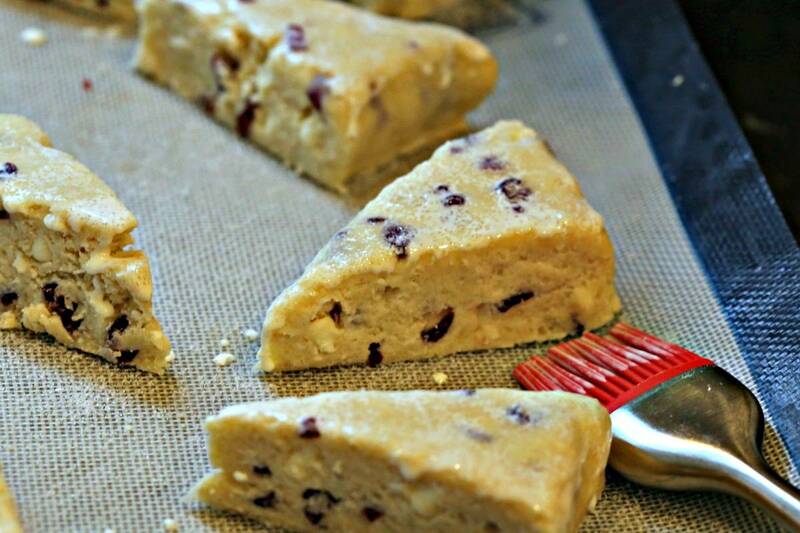 Make a well and pour in whipping cream, dried cranberries, and white chocolate chips. Stir until moistened most of the flour mixture is moistened. Using your hands, press the mixture together in the bowl, then dump onto a pastry board or wax paper. Gently press dough together and form into a 10-inch by 5-inch log. Using a dough cutter or sharp knife, cut into four equal pieces. Cut each piece diagonally (this will form a total of 8 triangle shaped scones). Place scones onto a lightly greased baking sheet and bake for 15 minutes or until golden. To make the glaze, place 1/2 cup white chocolate chips and 2 tablespoons heavy whipping cream in a microwave safe bowl. Microwave in 30 second intervals at 50% power, stirring between each setting until chocolate is melted and smooth. 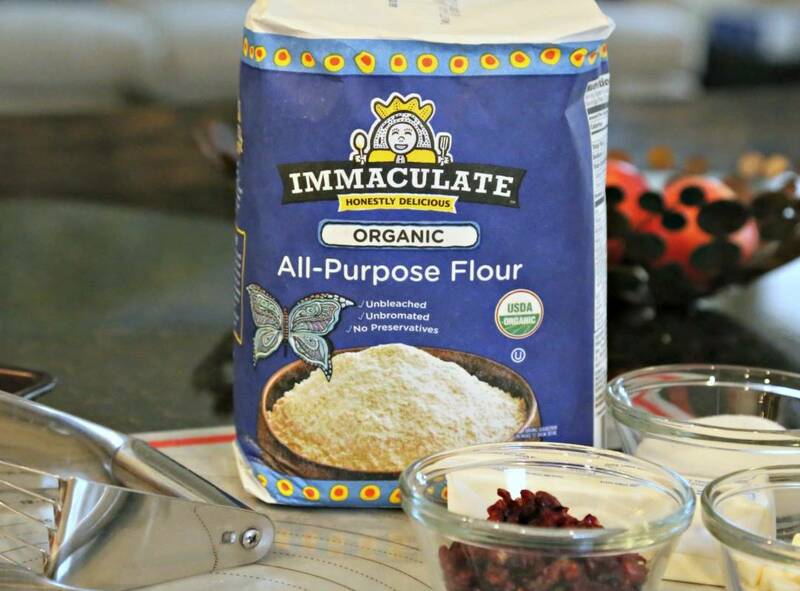 Drizzle over scones and sprinkle with additional dried cranberries, if desired.